My sisters from out-of-town and a local friend joined us for a simple Easter Sunday meal yesterday. It was a beautiful spring day. In late evening I stepped out into the garden and cut the most perfect flowers. I had been eyeing them all week. 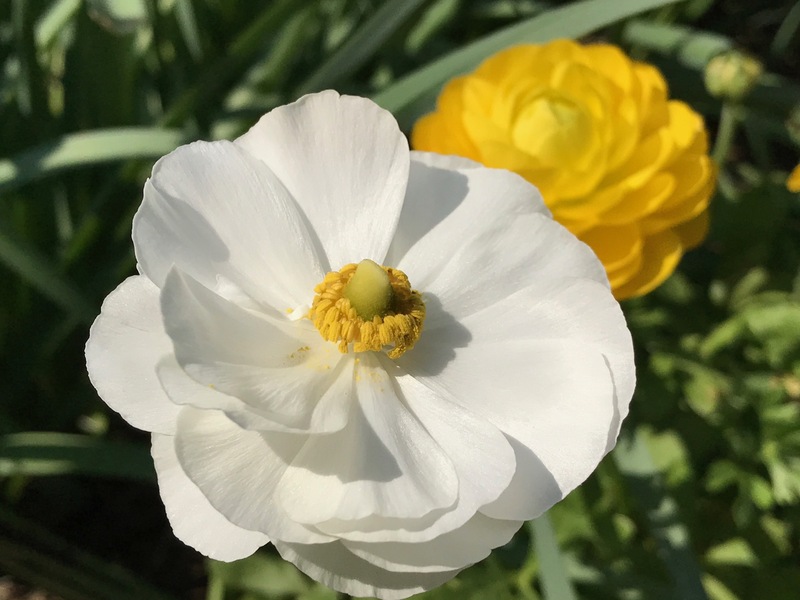 From a bag of 100 assorted Ranunculus, planted in March 2016, just four plants developed. Having never grown them before I expected a better return, but oh, how lovely are the flowers of the four which persisted. 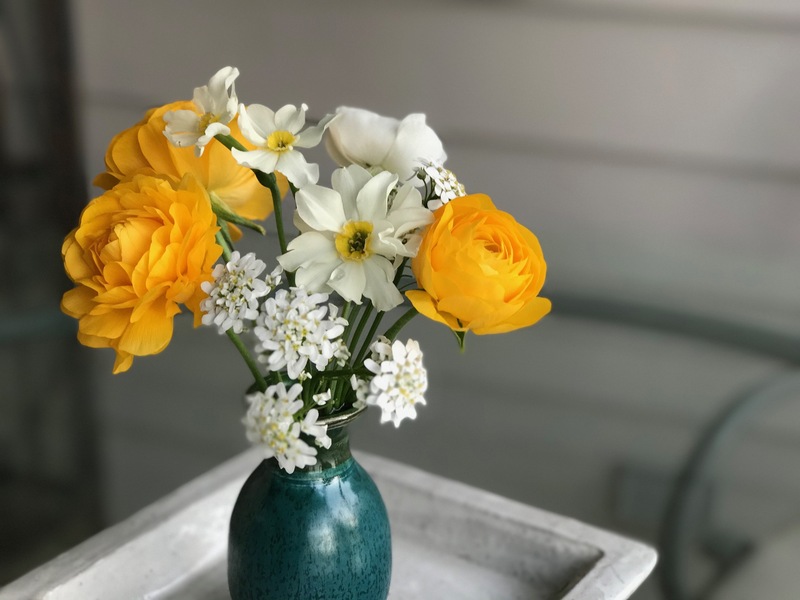 Placed into a small green ceramic vase with Iberis and Narcissus, the ranunculus are richly delightful—my new favorite flower. I read these can be planted in fall in my planting zone so I will try again to grow them. 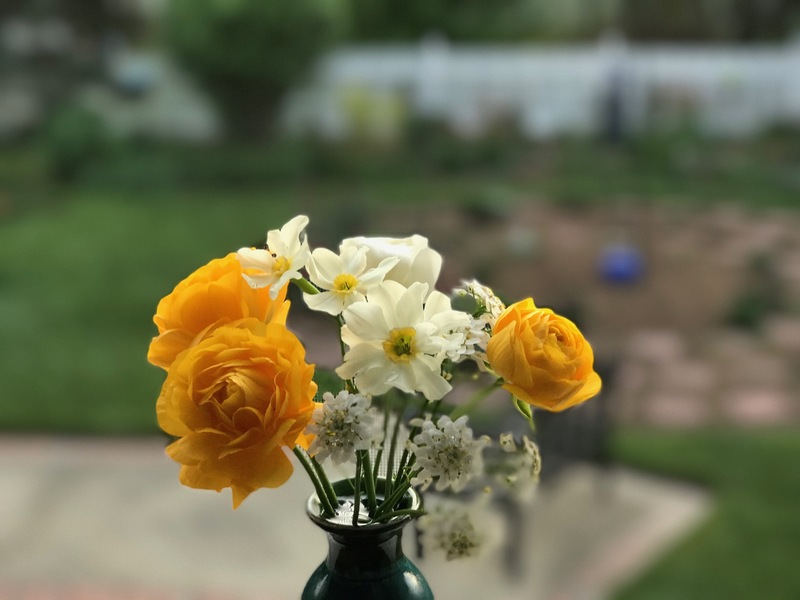 This entry was posted in garden and tagged 2017vase, flower arranging, flower design, Iberis Sempervirens (Candytuft), in a vase on monday, nature photography, Ranunculus on April 17, 2017 by pbmgarden. I’d agree that four from a hundred isn’t ideal but this one is certainly a stunner. I love the little daffodils too. I’ll try to find a better place for the ranunculus next time. Hope to improve the odds. The daffodils reminded me of some my mother used to grow. The smaller the better for me, when it comes to daffodils. Beautiful; did you soak the corms overnight before planting the Ranunculous? It is said they need it and I usually do, I get a better rate of growers but I grow in a large port and then plant them into the garden after they’ve flowered and so far they come back each year. I don’t actually remember if I soaked the corms, but I think the planting area didn’t have enough sun and didn’t drain well. I’ll try to take more care with them next time and maybe will try containers. Good to know they come back well for you. The ranunculus are scrumptious! And the colour of your little vase really caught my eye as well. I have learnt (yet another thing) from Christina too – will try soaking ranunculus corms when I plant. Happy Easter Monday! Happy Easter Monday to you as well Cathy. Let’s hope soaking the corms does the trick. The colors are perfect for Easter and the ones that grew, bloomed just at the right time. 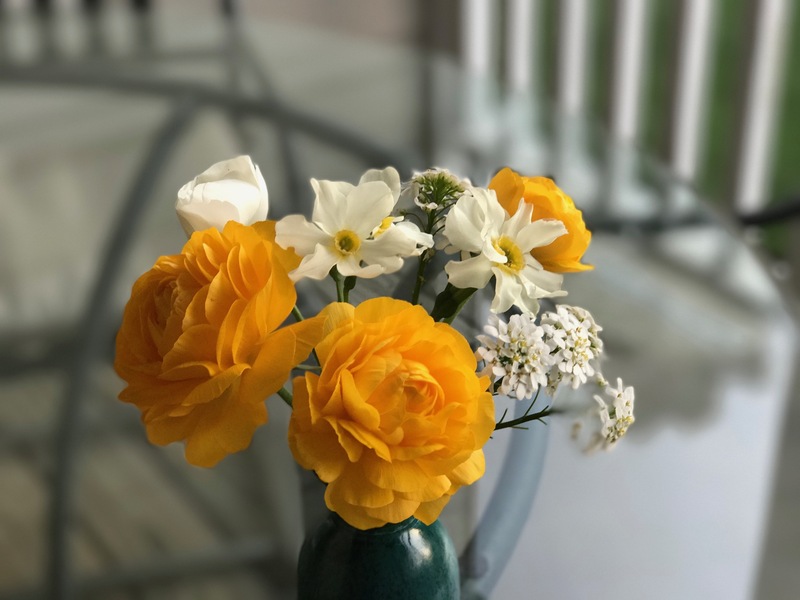 Seeing the ranunculus in the garden all last week was so satisfying. Amazing how fresh it still looked when I brought it indoors. Happy Easter to you Cathy. Hope your ranunculus decide to shower you with more flowers. I’ll definitely try growing them again. They are beautiful! And I love the combo with white. Hope you had a lovely dinner with your family. Our children and grandchildren just headed home this morning–fun weekend but exhausting! Thanks Marian, yes we had such a nice time. Hope you have a chance to relax today. They are indeed perfect blooms, Susie. The simple color combination is both elegant and bold – something that’s difficult to achieve! Thanks Kris. 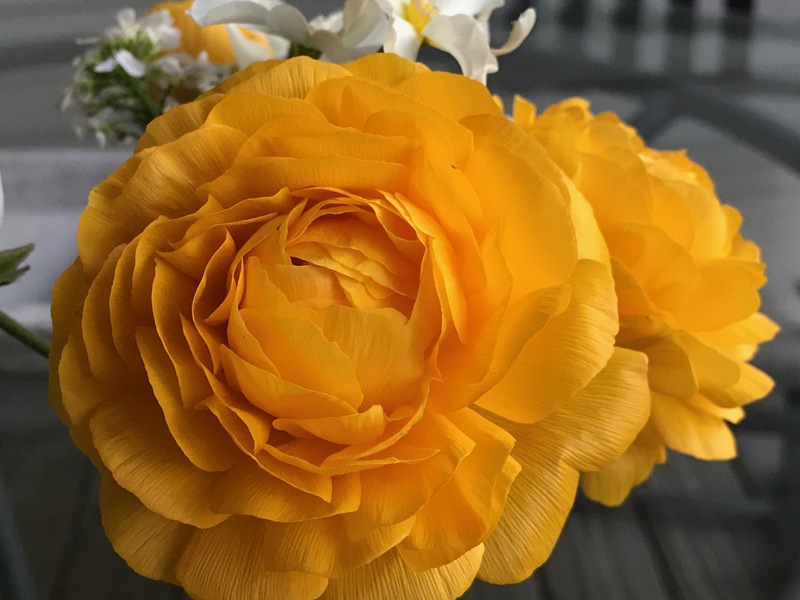 That yellow ranunculus seems to want to be seen, doesn’t it? Nothing subtle about it. I think so too. Fun to share flowers with like-minded people. They are truly gorgeous and what a colour. The other white flowers really set them off too. I’ve never managed to grow ranunculus well but, never knowing when to quit, I’m having another go! That’s the spirit, try again. They’re supposed to be easy to grow from what I read, but there must be a footnote somewhere that I missed. Thanks Cathy. I don’t often see ranunculus growing but they seem to be showing up more often around here (like at a farmer’s market). The bold yellow just shouts joy. Susie, those are just beautiful and I am amazed you grew any! Fantastic. Thanks, I’m definitely going to try again. My mother tried them for years and for good reason – I think your success rate was higher. Thanks for letting me know. That’s interesting to know maybe they’re not so easy as I thought. What an absolutely gorgeous yellow, just like egg yolk. The whites and creams of the other flowers complements it perfectly. Yes, very much like egg yolk! Thanks. I can see why they’re your new favorites. They’re so bright and hopeful! Great combination of flowers in the vase, too! Thanks Beth. The ranunculus seem so perfectly formed and pristine. A few more have opened and each one is a revelation. Have a wonderful week. So pretty, I love ranunculus and always forget to grow any. They are perfect for a vase. Thanks Liz. Well you grow so many things I wonder how you keep it all straight. 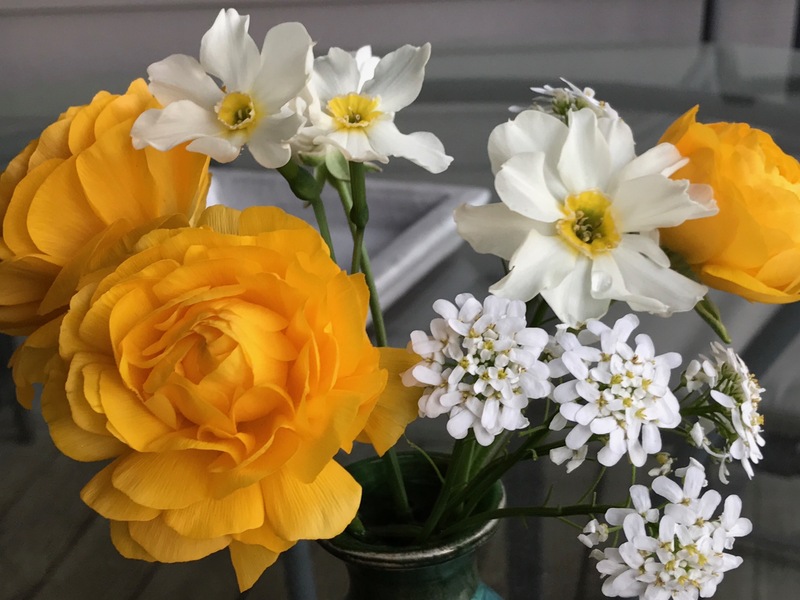 These flowers shreak Easter – absolutely lovely 🙂 love ranunculus 🙂 mine haven’t really got going yet – it’s been cold and wet in Manchester so I’ve got tete a tetes and daffodils in my vase this week. Hope it warms up a bit for you Bec. Tete-a-tetes are marvelous. Thank you. A few more opened this week to my great delight.